Click here for pre-recorded webinars on the functions of dotloop. These webinars will allow you to be able to watch the instructions. You are able to pause the video at any time. This will allow you time to sign in to your dotloop account and practice what you have just learned. dotloop is killing paperwork and changing the real estate industry by providing a secure online platform where real estate agents, buyers and sellers collaborate to complete a transaction online. 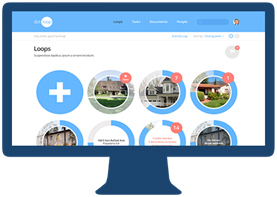 dotloop brings all parties involved in the real estate transaction together online to add, adjust, approve and sign documents digitally — completely streamling the buying and selling process for real estate in a way consistent with consumer expectations. Click below to see how dotloop can change the way you do business!!! To obtain the Toledo Regional Association of REALTORS forms for your account please click here. Click here for dotloop support articles.